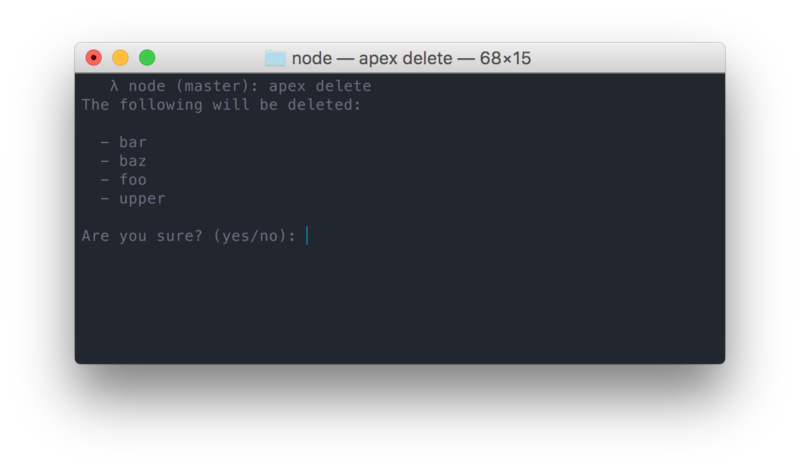 Apex is a small program written in Go for managing “serverless” architecture via AWS Lambda, allowing you to focus on code instead of infrastructure. I started Apex because I’ve been working on a number of product ideas as a solo engineer, I can’t afford to spend time managing and maintaining machines if I’m going to have a successful product as a single person team. I love Amazon’s Elastic Container Service, but even managing and maintaining clusters of machines and the ECS agent is a lot of overhead if you don’t need the additional flexibility. AWS Lambda has some limitations, as you cannot install system libraries and so on, but for many problems it can be a great solution. The main problem with Lambda and API Gateway is that the usability just isn’t there, so Apex is an attempt to fix this! 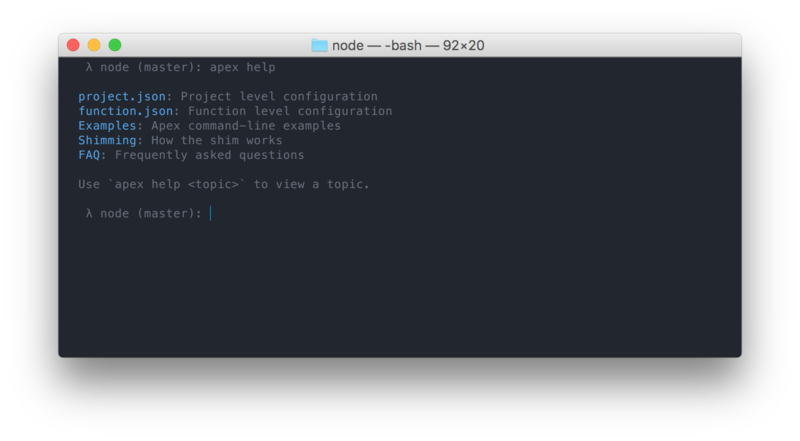 The project has already been seeing some great contributions and we’ve just released v0.4.1, so I’ll do a quick run through of Apex so far. 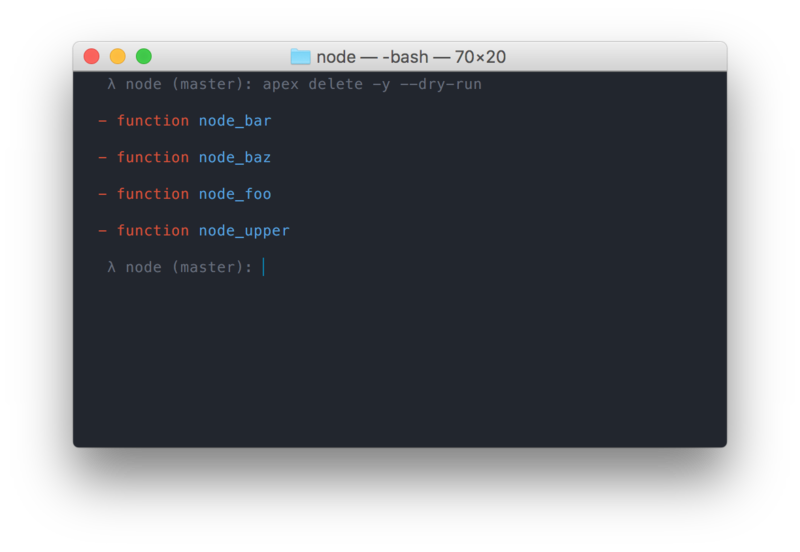 Currently Apex has two concepts, a “project” and a “function”, where a project is simply a collection of functions and other resources, and a function is a AWS Lambda function. You can read more about the configuration file properties in the Wiki. 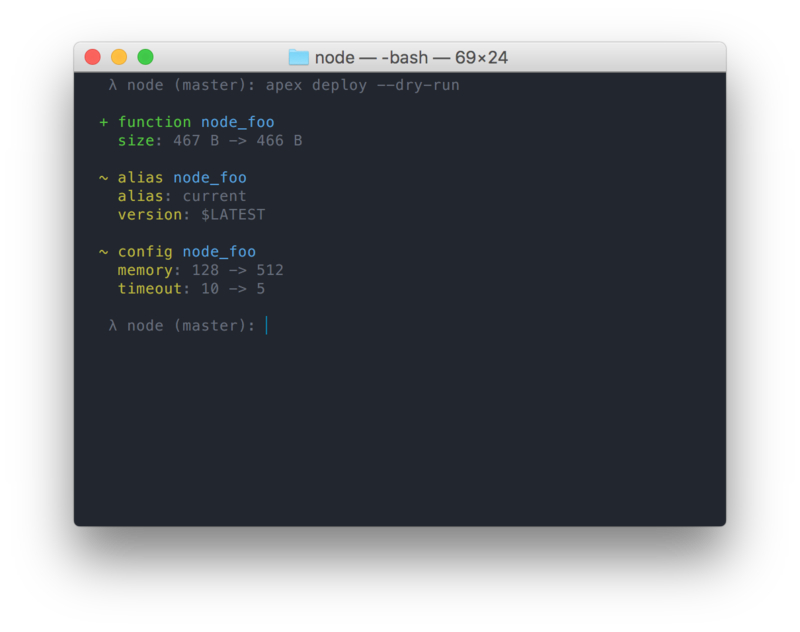 Apex supports concurrent idempotent deployments, making multi-function deploys very simple and responsive. If the code has previously been deployed it’s simply a no-op. 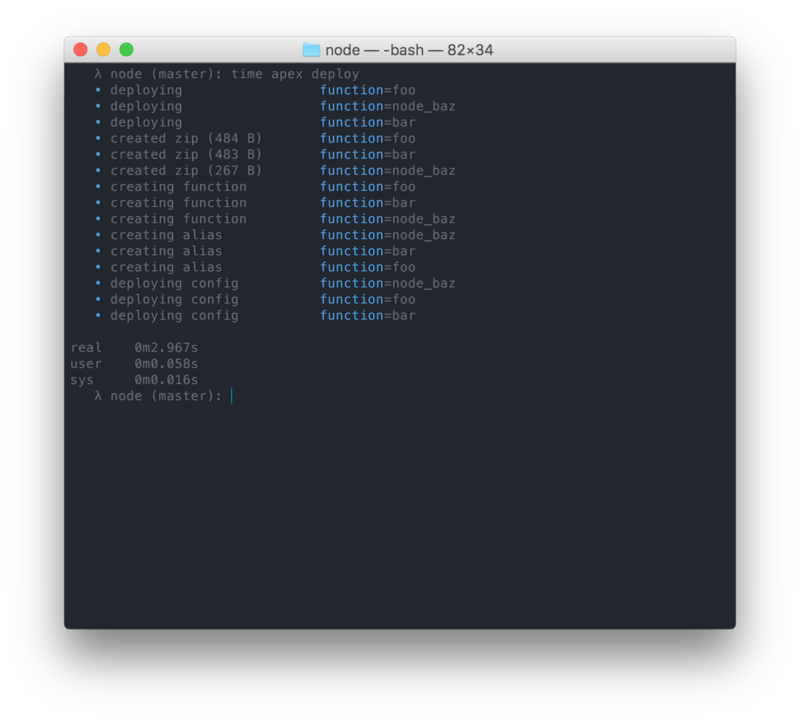 Configuration is also updated on deploy, so all you need to do is tweak the code or json config, run `apex deploy`, and you’re done. You can of course deploy individual functions by specifying them as arguments, such as `apex deploy foo bar`. 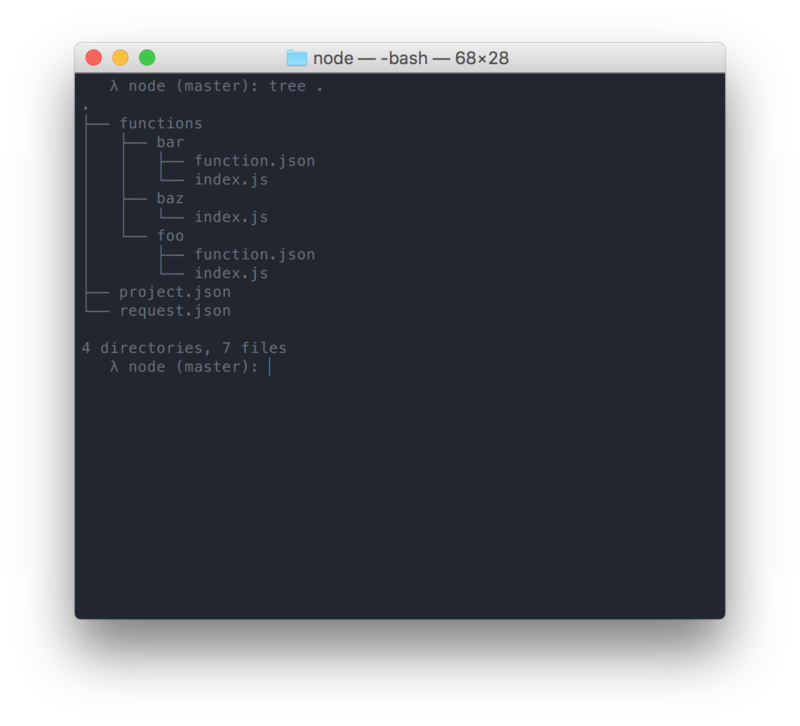 The Apex invoke command allows you to invoke a function via JSON stdin, and supports streaming. 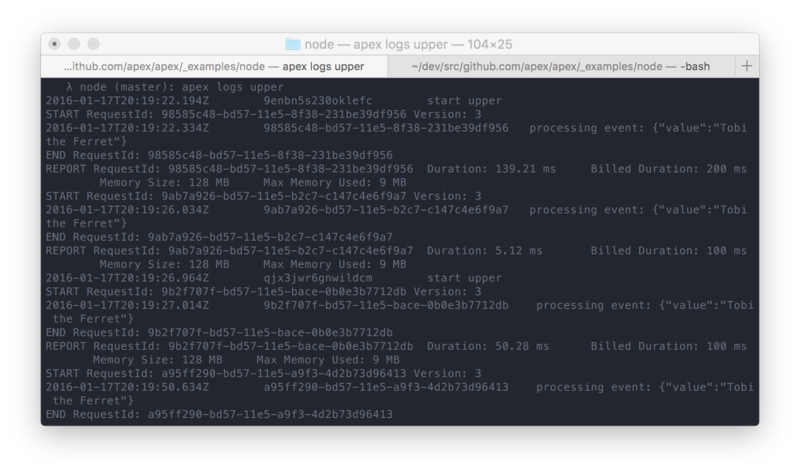 Apex supports CloudWatchLog log tailing via `apex logs <name>`. In the future we’ll allow tailing all of your functions at the same time. CloudWatchLogs has a slight delay of a few seconds, so that’s something to keep in mind. Kinesis would be more ideal here, however CloudWatchLogs handles cases such as uncaught exceptions or panics which manual Kinesis logging would be less ideal for. 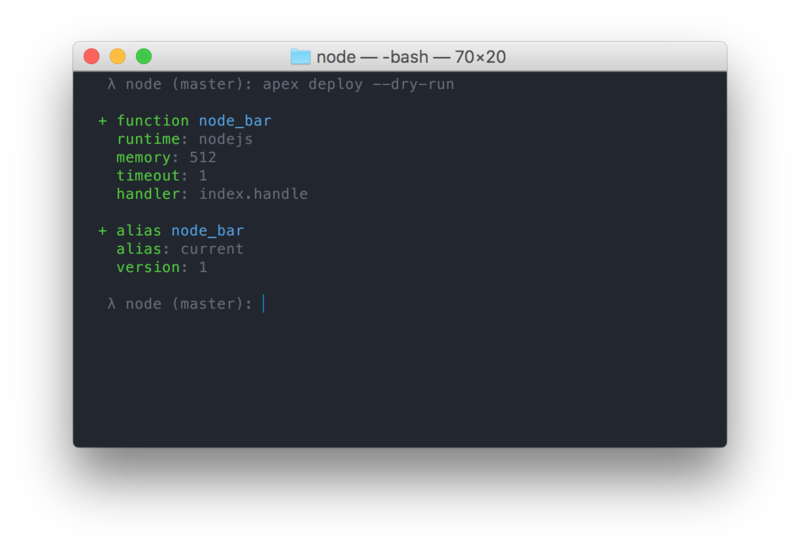 Apex supports multiple runtimes, currently Node.js, Python, and Golang. 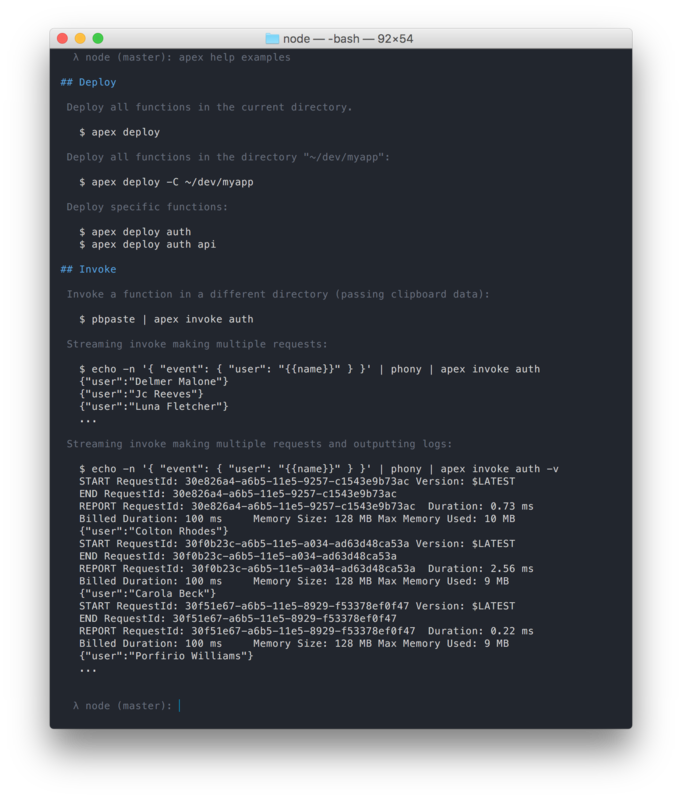 When a language is not supported by AWS, a Node.js shim is injected into the zip, which feeds the events to your program over stdin, and responses over stdout. 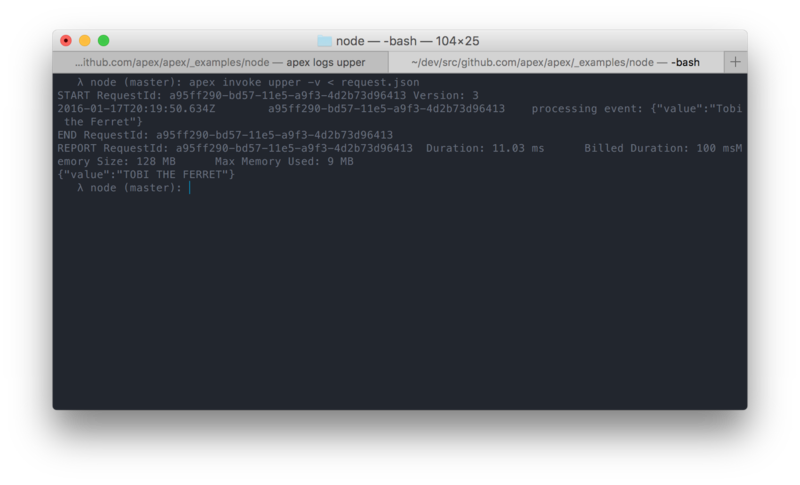 The apex/apex repository ships with a Golang package which can be used to accept these events over stdin. This has a beneficial side-effect of easy local testing over stdin. This same concept could be applied to any language which can produce a cross-compiled binary or which compiles down to one of the languages supported by Amazon. Although I can’t build these all by myself, it would be very cool if the community could come together and build the same for C, Rust, Scala, and so on. We plan on adding hook support and moving the current runtime logic into hooks so that you could transparently compile ES6, CoffeeScript, TypeScript and others, treating them as first-class Lambda runtimes as well. 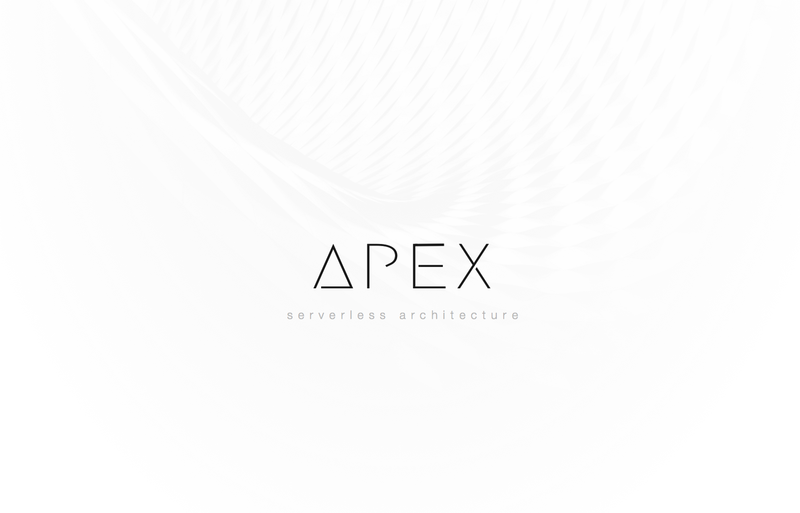 If you’d like access to the Apex org to help contribute please leave a note on https://github.com/apex/apex/issues/83. This is definitely just the beginning, but barring some exceptions, I think Lambda and similar will drive a new computing paradigm. At the end of the day, no one really cares about machines, containers, we just care about logic and results. There are certainly limitations now, but over time this kind of platform will become more powerful. As for the future of Apex itself, we’ll be adding features for managing API Gateway, Lambda input sources and so on to help improve the workflow. Our goal is not to replace existing tools that do a great job for this, such as Terraform, however there are cases where bootstrapping via Apex, and managing via Terraform is appropriate. There are also several other tools that allow you to manage Lambda functions such as Serverless (which has really awesome gifs!). Hopefully over time we can get a better idea of what works best, and settle on some sort of RFC, at least at the basic project structure level for interoperability.